In the Shrink Ray Island Walkthrough adventure, a science fair student, the smartest one of them all, has gone missing. It is your goal and job to find out exactly where this student has gone or who has taken him! This genius science fair student has invented one of the most powerful and amazing things ever seen by Poptropica. If you haven’t guessed it is a Ray Gun! Both the student and the ray gun have gone missing. 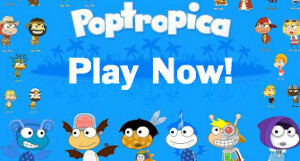 If the Ray Gun gets into the wrong hands it could be the end of Poptropica as you know it. Do you have what it takes to solve this mystery? Check out the Walkthrough of Shrink Ray Island below and let me know how it goes. Enter the science fair building and go to the right. Go through the doors that say Science Fair and walk to the right. Ask the kid with the magnet display if you can help with anything. He says he wants you to go to his apartment on Avenue A. Exit the Science Fair building and run to the right. Enter the blue apartment with the cat on the front steps. Try to catch the cat and follow it into the bathroom then back into the living room. Walk over to the left and click on the microscope. A guy will come out and shoot you with a shrink ray. Walk to the right over to the shelf with the books and trophies on it. Jump and climb your way to the top and push the book off of the left side. Jump down and walk to the right. Keep walking until you notice the piece of paper on the table. Climb up onto the counter and walk all the way to the left. Push the round object to the right to scoot the teapot over. Use the steam from the teapot to jump up onto the shelf with the flour and sugar on it. Knock the bottle of grease over then jump down to the ground to slide the cat bowl under the dripping liquid. Jump up onto the counter then jump on the bag of cat food to dump it into the bowl. Push the cat food bowl over to the right so you can use it to jump up to the note. Take a grape from on the table and run to the left with it. Jump up the drawers to the toaster and plug it in. Use the toaster handle to spring up to the top shelf. Push the salt shaker over to the left side of the handle then jump on the right side. Use the handle to boost you over on top of the fridge to your left. On top of it you’ll find a remote control. Jump down and run to your left until you see the truck on the ground. Take out your screwdriver and use it to take the battery out of the truck. Jump up on to the table and put the battery in the TV remote. Jump on top of the TV and climb onto the antennas to get static. From the antennas, jump over onto the green balloon, then onto the picture frame. Jump to the left over on top of the aquarium and turn it off. Get back on the TV and get static from the antennas again. Jump up to the green balloon again but this time try to get to the higher picture frame. Jump over to your left onto the shelf with the fish food on it. Push the fish food over to the left side to give the fish some food. Then drop down into the fish tank to find the Diary Key. Turn the fish tank back on and then go take the battery out of the remote. Put the battery back in the truck and drive it to the left until you hit the computer chair. Jump up to the diary on the shelf and use the key to open it. Get back in the truck and drive it to the right until you get to the kitchen. Get out and push the sponge to the right past the bucket. Get back in the truck and park it in front of the bucket. Jump on top of the truck then into the bucket. The torn page from the diary is at the end of the maze of cans. You have to push them out of the way to clear the way to the page. Watch out for falling cans! When you pick up the page, hit the restart button and exit the bucket. Run back to the left and climb up to the diary. Take out the missing diary page and read what it has to say. It says the thief is outside and that he shrunk himself down. Then it has the clue: Lemon+Paper+Lightbulb. Jump down onto the computer desk and take out the piece of paper under the lamp. Jump on top of the lamp to point it down at your paper, then click the switch to turn it on. The note says “Look for me in the telescope. School coordinates.” Walk to the left and tip the purple bucket over onto the air vent. Use the air vent to lift you up onto the bed. You’ll find a Morse Code Key on the bed. Jump over on top of the fan to lower it to the ground. Turn the fan on then run under the bed. Jump back onto the computer desk and take out the flash drive you found. Use the keyboard to enter the password. The password is m4r13 cur13. You’ll see an email about the shrink ray then it will copy the shrink ray plans onto the computer. Run to the right until you get to the bathroom door. Jump up onto the counter then over to the hairdryer. Turn the hairdryer on and use the wind to launch over into the shower. Push the bar of soap over to the right then turn on the faucet. Push the floating soap over to the left side of the tub to jump out of it. Jump onto the toilet seat and take out the flash drive to flush it. To flush the toilet, jump onto the flush lever. Exit the bathroom the same way you came in and run to the left until you get to the telescope. Jump on top of the telescope and change the X coordinate to 87 and the Y coordinate to 16. You have to translate her Morse Code message using the key. Her message translates to say “Thief is Mr Silva”. You have to get to the school to save her so run to the right and get in the truck. Drive to the left until you jump it out the window. Drive the truck to the right down the sidewalk and try to avoid obstacles. You have to use the sign to jump over the river. Keep driving until you go up the rake to Mr Silva’s office. Ask her what you should do. Then Mr Silva shows up with the shrink ray. Run to the left and hide behind objects to avoid the shrink ray. Jump up on the table with the globe to knock it down on the ground. Push the globe over next to the office chair and jump onto the chair. Jump up on the table and hide behind the mirror. Mr Silva shoots the mirror with the shrink ray and shrinks himself! He falls into an ant cage and is stuck. Drop down to the ground and turn the shrink ray on. You will be back to normal size and be awarded the Shrink Ray Island Medallion! I cant chase the cat in the house then get shrunk. Why? How do you turn on the heat for the air vent? Yeah I was just readimg through until it came to ‘use the air vent to lift you onto the bed’ You never even explained how to turn the air vent on!?! You can’t. It turns on after awhile. where do I get the screwdriver? I give up!!!! i cant do the hair dyrer bit ive been trying for 2 hours! its doing my head in !!!!!! How do you get out of the bathroom if you accidentally pushed the soap the other way? how do I get out of the bathroom!?!?!?! I’ve won the whole thing!:)!:)! :) You click both buttons on the hairdryer to get in the shower. You use the screwdriver in the kitchen to open the batterie slot. You get the grape to fling yourself from the toaster. You push the salt on the spoon and jump on the other end and wait then you find the control. You push the globe under the chair (and for protechtion you skip the chemical, the first one and use it for later) and jump on the chair, go behind other objects then go behind the mirror and he shrinks himself. You use the batterie on the remote, turn on the TV, jump on the intenna get its static then jump on the green balloon. You turn the filter, do what is said in the sentence before push over the fish food so the fish don’t push you out, go to the computer, jump on it, and use the key to open the diary on the shelf. Use the batterie on the truck, go to the kitchen, jump into to the trash can and that’s where the torn paper is. I don’t know how to explain how to get through but once you get the paper click restart and come out of the trash can. You can’t push the soap the other way. When you set the telescope correctly and you figure out the code (short flash = . long flash = -) you can drive out the window.